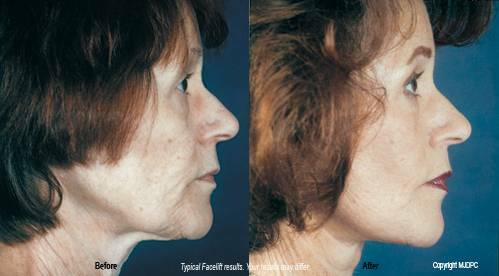 Not long ago, a facelift was considered by many to be reserved for movie stars and celebrities. Today, a facelift, or rhytidectomy, is not just for the rich and famous. It is one of the most well accepted and most frequently performed cosmetic procedures in the United States. Recent studies have shown that looking good has a direct correlation to higher pay. 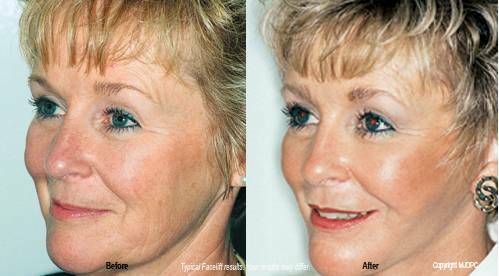 Dr. Roger Orsini performs facelifts for patients in Maryland, Delaware and Washington, DC so that you can look younger and feel better. People from every walk of life are electing to have a facelift for cosmetic as well as economic reasons. If you have been considering a facelift to reverse the signs of aging, you should understand what a facelift can and can't do. Although the incisions made for a facelift are hidden back in your hairline, it does nothing to correct the visible signs of aging in the upper face. A facelift provides an overall lift to the lower third of your face by tightening loose skin in the jowls, neck, and jaw line. A facelift alone will not remove forehead wrinkles, crow's feet or bags under your eyes. These areas can, however, be treated at the same time as your facelift. During your initial consultation, Dr. Orsini will discuss your particular condition, your expectations, and the probable outcome of your various treatment options. You will be shown several before and after photographs of patients having similar conditions, and we will explain the details of your procedure. 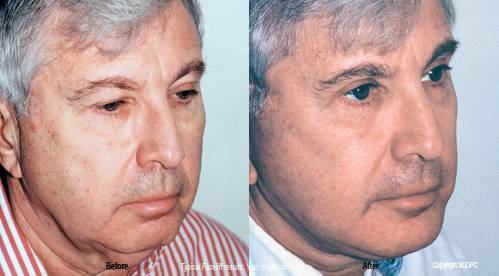 Before and after photos may be taken of your face to document your results. A facelift procedure may be performed in your doctor's office or in an outpatient surgical facility. Premedication is generally recommended to relax the patient. The procedure is usually performed under general anesthesia with the patient asleep, but can be performed using a local anesthesia. Dr. Orsini will operate on one side of the face at a time. The incision is placed in the natural crease of the facial skin and begins inside the hairline, in the temple area above and forward of the ear. It continues inside the ear, or in front of the ear around the earlobe and behind the ear. The skin is lifted outward and the surgeon tightens and repositions the underlying muscles and tissues. Excess skin and fat may be removed. The incision is then closed with fine sutures and/or metal clips. If metal clips are used, shaving hair from the incision site may be avoided. A facelift can take between 2 - 4 hours depending on the extent of the procedure. Some relaxation of facial tissues will occur during the first few weeks. After that, the aging process continues. Your lifestyle choices, bone structure, skin type, sun exposure and heredity all play a role in determining how many years can be removed and for how long. In general younger patients enjoy longer-lasting results. If you are in your forties, the effects may last up to 10 years. If you are in your sixties, your results may last 5 - 7 years. Surgery performed purely for cosmetic reasons may not be covered by your health insurance. However, cosmetic surgeries performed for medical or reconstructive reasons may be covered in part or in whole by your health insurance. It is the patient's responsibility to check with their insurance provider for information on the degree of coverage. We will be happy to answer any questions you may have regarding payment. After Dr. Orsini performs your facelift, there will be bruising and swelling that will persist for a few days. Pain is normally minimal and can be controlled with oral medication. We will take off your bandages in our office in 1 - 2 days after surgery. You may then go home, take a shower and wash your hair. Sutures may be removed in stages to minimize scarring. Healing is a gradual process. After about 2 weeks you will feel comfortable (with make-up) among strangers. After 3 weeks you will look and feel confident enough to go out with friends again. Your face will feel completely "normal" in about 10 - 12 weeks. Direct sun should be avoided for several weeks. Most patients are delighted with their new, more youthful and relaxed appearance.